FIGURE 4.11 Peak power tracking architecture for a mission with wide variations in solar flux and temperature. 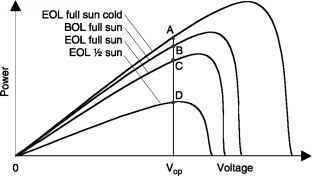 charging or the load demand exceeds the solar array output. Otherwise, the excess power is left on the array raising the array temperature. The battery relay is opened up when the battery is fully charged. • The solar array output power — the product of voltage and current — is continually computed and fed to the peak power tracker. The array operating voltage is changed until the peak is detected. • As seen in Chapter 8, the bus dynamic and static (a.c. and d.c.) impedances are equal in magnitude at the peak power point. A ripple is injected into the solar array bus, and the dynamic impedance dV/dl and the static impedance V/I are continuously measured. The bus voltage is adjusted such that both impedances are equal. 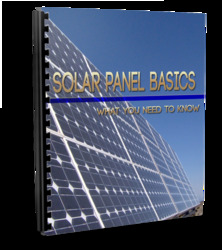 • The ratio of the Vmp to the Voc for any solar array is approximately constant, say K (typically 0.70 to 0.75). The Voc of a solar cell coupon maintained in the same environment as the main array is continuously monitored. 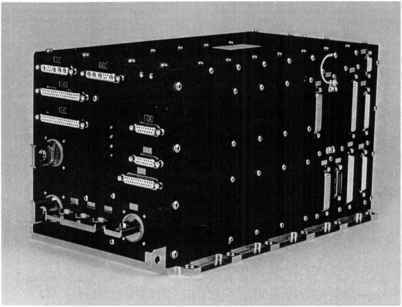 The operating voltage of the main array is then adjusted to K-Voc to extract the maximum power. where K is a suitable constant. The peak power voltage thus derived is fed to the series switching regulator, which then converts the array voltage to the load voltage. Figure 4.12 shows a complete PPT assembly. 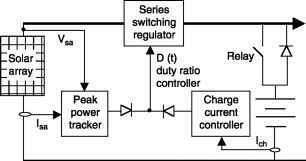 FIGURE 4.12 Power regulator unit with peak power tracker. 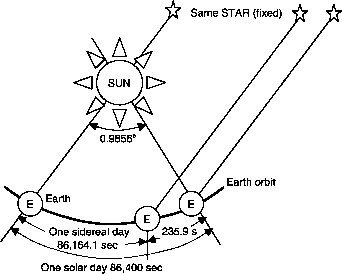 In low Earth orbit, where the battery must be charged in a short period. The PPT allows maximum power to be captured for several minutes after each eclipse when the array is cold. Architecture without the PPT feature, such as a DET bus, would waste a significant amount of power as shown in Figure 4.13. 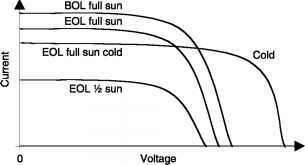 If a DET system were designed to deliver the required power at one-half the illumination at EOL, the power waste would be CD watts at EOL full sun, BD watts at BOL full sun, and AD watts at EOL full sun on a cold array. The PPT design eliminates this waste by utilizing all the power that can be generated. FIGURE 4.13 Power wasted in direct energy transfer architecture in certain conditions. The main advantages of the peak power tracking are that it maximizes the solar array output power all the time, and it does not require the shunt regulator and the battery charge regulator. On the other hand, it results in poor system efficiency due to power loss in the peak power tracking converter. Moreover, since this loss is dissipated inside the spacecraft body, it negatively impacts the thermal system. The PPT can have three configurations: series, parallel, and seriesparallel, as shown in Figure 4.14.1 The series-parallel configuration yields better system efficiency because the input and the output power conversion is processed by a single converter for all operating modes, as seen in Table 4.1. A PPT algorithm has been developed2 and tested using only the solar array voltage information, giving the tracking control without using current sensors. This results in low ripple current, hence lighter bus filter capacitors. (c) Series-parallel configuration FIGURE 4.14 Battery charge and discharge options in peak power tracking architecture.